← Daikokuyu: The Best Ramen in LA? The interior at the 101 Cafe. Photograph by Edward simon for The Los Angeles Beat. Before there was Interstate 5, tying the USA’s northern and southern borders together, there was US Highway 101. The El Camino Real (the Royal Road) started out as a trail between Indian villages and later on, the missions of California. Over the years, it became one of the most important routes on the West Coast, known famously as the ‘Hollywood Freeway’. In 1964, US-101 was replaced between downtown Los Angeles and San Diego by the I-5, but remnants of the highway can still be driven on. In Oceanside, US-101 has been renamed the Coast Highway and runs through the city along the coast. 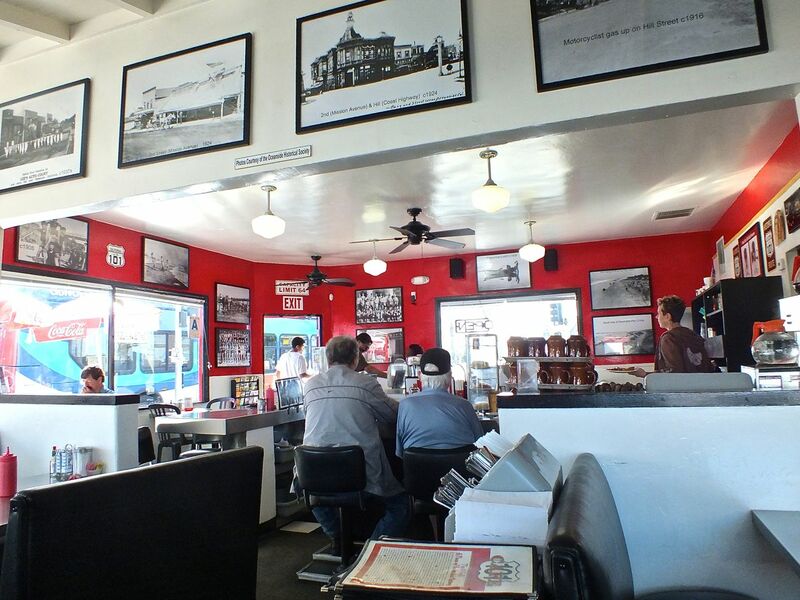 In the middle of Oceanside sits the 101 Cafe, whose existence on US-101 dates back to 1928. The chicken fried steak with home fries at the 101 Cafe in Oceanside. Photo by Edward Simon for the Los Angeles Beat. The 101 Cafe looks much the same as the building did in 1928, except for a patio out front with several tables. Real signs that used to mark US-101 adorn the building inside and out. 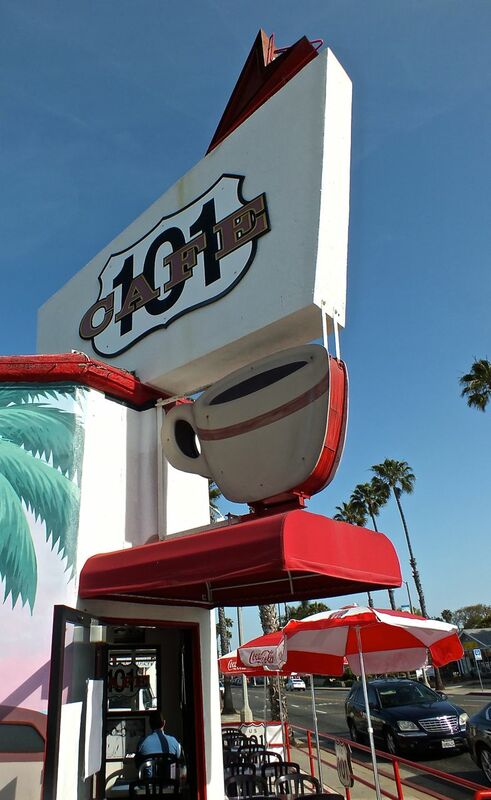 Inside, the gleaming bar stools and comfortable booths evoke a time when you’d put the top down, throw some beach blankets in the car and maybe a surfboard too and drive down to the beaches near Oceanside, stopping for a delicious breakfast or lunch at the 101 Cafe. 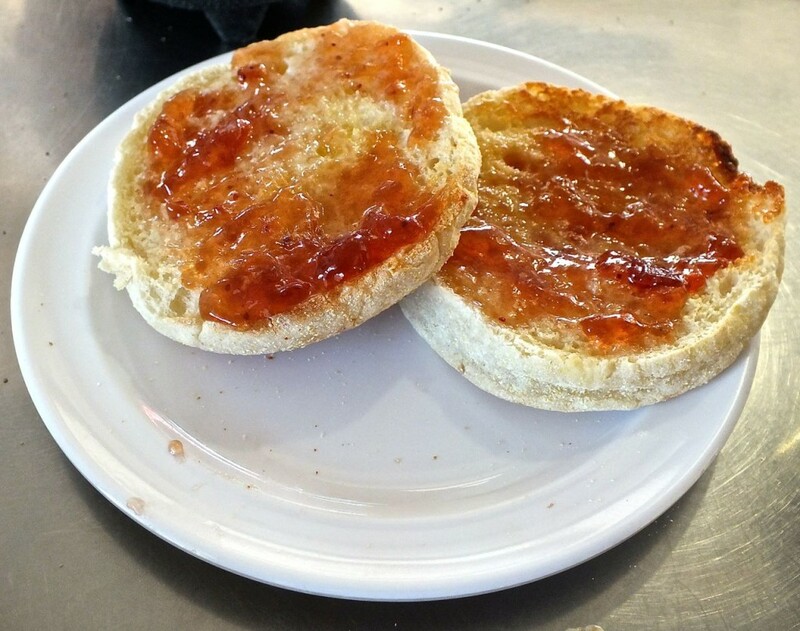 English muffin with jam at the 101 Cafe. Photo by Edward Simon for The Los Angeles Beat. The 101 Cafe features both breakfast and lunch items. 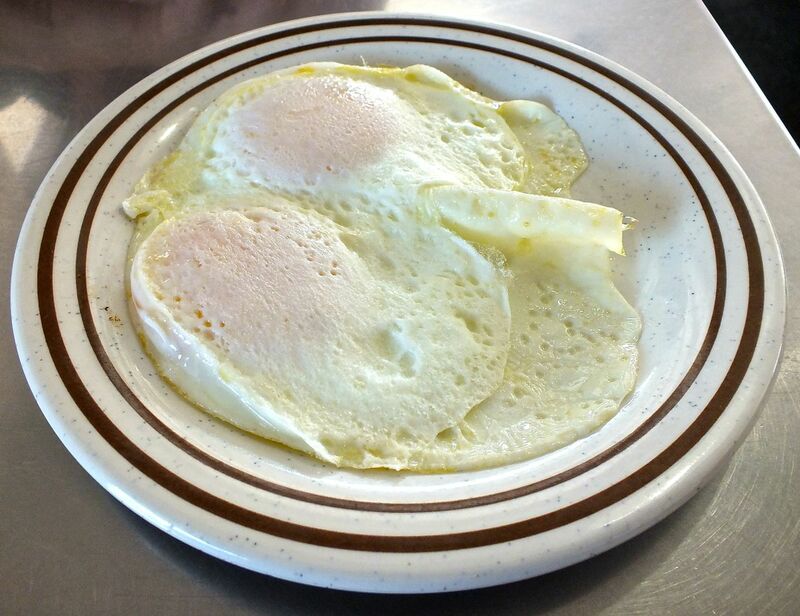 The ‘Two-Lane Special’ includes two large eggs, cook any way you want them to order and two buttermilk pancakes. 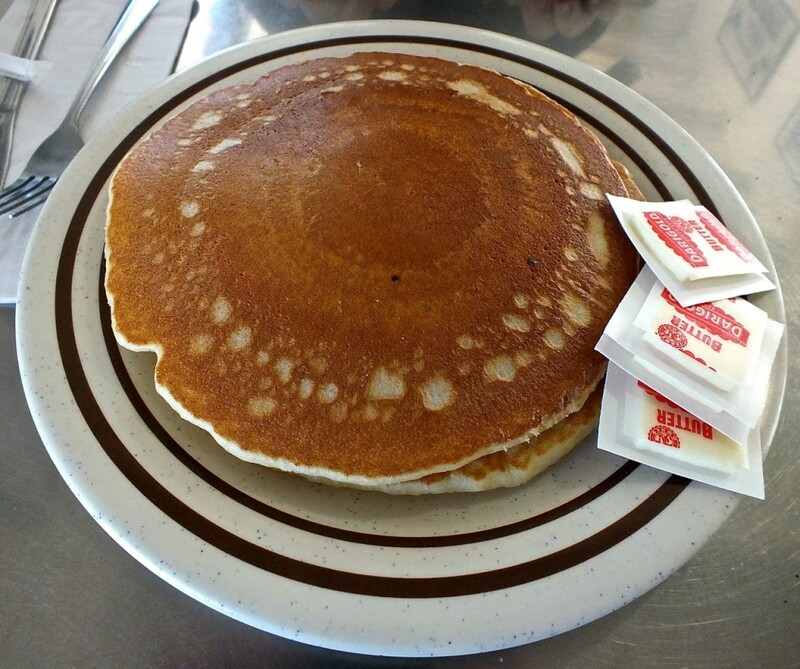 The pancakes are large and fluffy, served to order on a plate that shows their huge size. Two pieces of smoked bacon or two links of sausage accompany the breakfast. The pancakes are also available by themselves in a three pancake order, the ‘Stacked Up at the Light’, or as a two pancake short stack, the ‘Stop Short’. A nice, thick chicken fried steak at the 101 Cafe. Photo by Edward Simon for The Los Angeles Beat. 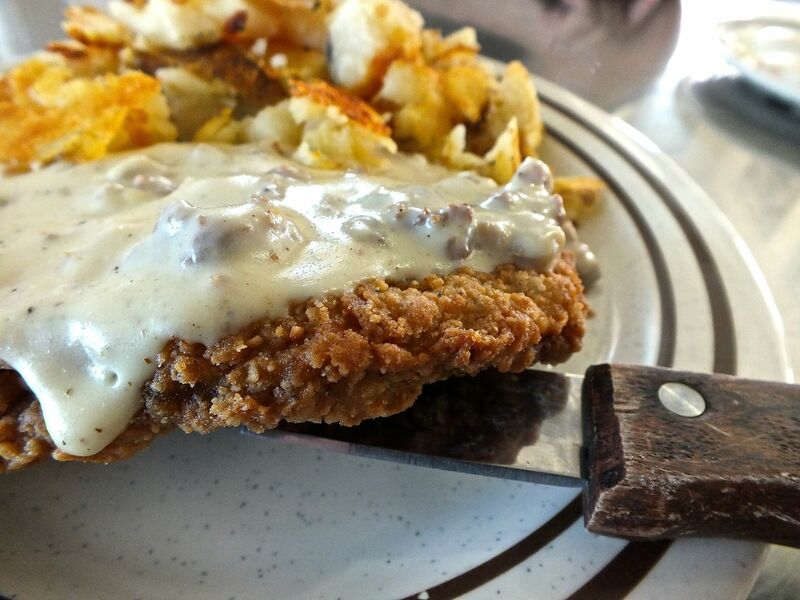 The ‘Driving South’ is 101 Cafe’s name for their chicken-fried steak and eggs breakfast. The chicken fried steak was thick, perfectly battered and fried to a golden brown. The CFS was really delicious, a hand-battered piece of beef that was fresh and hot. Two eggs came with it and a side of toast. Freshly made home fries completed the order, nicely crisped and with plenty of black pepper for a great taste that will wake up your taste buds. Huge buttermilk pancakes from the 101 Cafe in Oceanside. Photo by Edward Smon for The Los Angeles Beat. 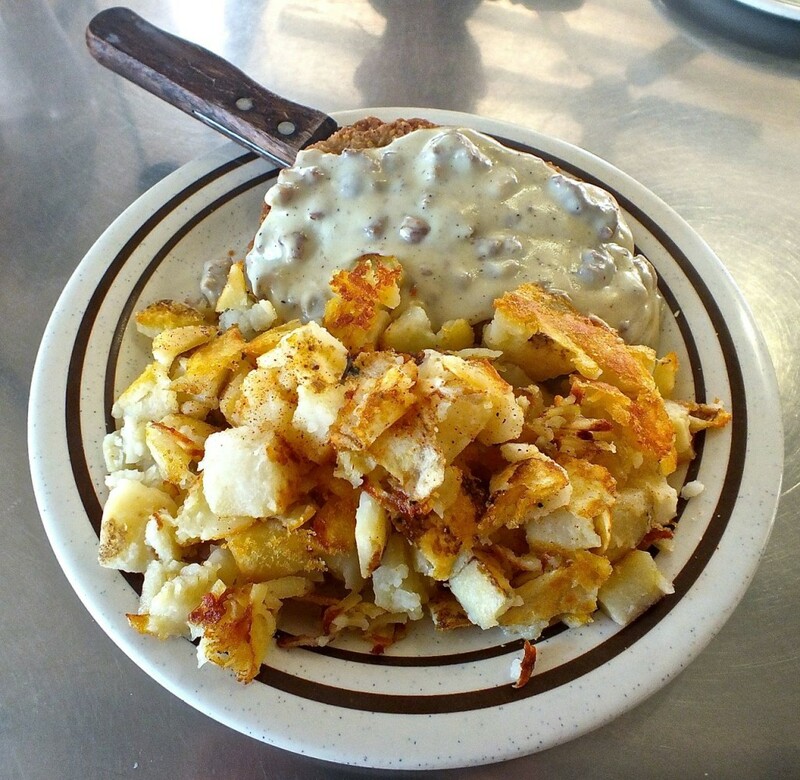 Other breakfast dishes include the ‘South of the Border’, which has machaca chicken or beef scrambled with eggs, cilantro, tomatoes, and onions; or the Classic SOS, an homage to the nearby Marines at Camp Pendelton, with the home fries and their thick classic country gravy. For those who want it all, there is the ‘Long Haul Favorite,’ which includes an 8-oz. Center-cut top sirloin served with the home fries and eggs. Other items include Eggs Benedict, French Toast and corned beef hash. Over easy eggs at the 101 Cafe in Oceanside. Photo by Edward Simon for The Los Angeles Beat. Not forgetting the more health conscious person, they have healthy bread choices from Oceanside’s Mahler’s Bakery such as ‘Flax Soy’ and ‘Vegetable Protein’. Also available are an oatmeal breakfast and Vanilla yogurt. For lunch, A Veggie Burger is on the menu as well as a wide choice of salads. For lunch, a wide variety of plates are available. Hamburgers, Chicken Burgers, Turkey Burgers and Cheese burgers all come with a side of fries. The Ortega Burger adds a nice green chile taste to their burger, while a Mushroom Burger adds sauteed mushrooms and tangy Swiss cheese. ‘Size up our Chili Burger’ is their version of the Chili Size, made with their own freshly made chili and beans, cheddar and onions. Hot and cold sandwiches are also on the 101 Cafe’s menu. Barbecued carved pork and beef, broiled chicken and hot meatloaf can be had for lunch. From the sea, a tuna melt and fried fish sandwich are good choices. Cold sandwiches include tuna, chicken, egg salad and a Club sandwich, made with either ham or turkey. Sides include potato salad, their ‘Classic Drive-In Fries’ and beer battered onion rings. 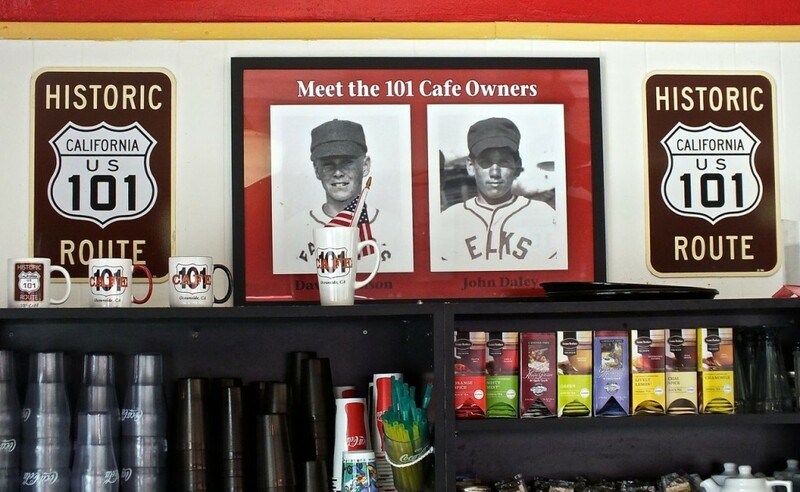 the 101 has photos of the original owners in the early days. Photo by Edward Simon for the Los Angeles Beat. The 101 Cafe is a nice place to stop on the way down to San Diego, or can make a fun destination day trip from anywhere in L.A. With freshly made food, a nice casual atmosphere and a fun, traditional diner look inside, it is definitely on of the best options whether you are traveling on ‘El Camino Real’ to enjoy all the beach towns or flying down I-5 and want something better to eat and enjoy than the fast food places just off the interstate. The 101 Cafe in Oceanside has a nice look that goes back to the Roaring 20’s. Photograph by Edward Simon for The Los Angeles Beat. Ed is a native of Los Angeles who loves food and food cultures. Whether he's looking for the best ceviche in Colombia, the best poke in Hawaii, the best tequila in Jalisco or the best Taiwanese Beef Roll in Los Angeles, it's all good food! He also loves a good drink. 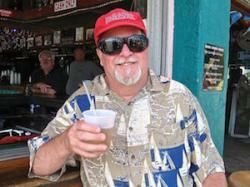 He's had Mai Tais in Hawaii, Bourbon in Kentucky, Tequila in Mexico and Rum in Jamaica. His wine escapades have taken him to Napa, Sonoma, the Willamette Valley and the Santa Ynez Valley. And he's had beer all over the world! Music is another of Ed's passion, writing and interviewing many classic rock, rock and blues musicians. Getting the great stories of road experiences from them is a particular delight. Traveling also fits in with Ed's writing, exploring all over to find the most interesting places to visit, even in out of the way areas.